We’d love your help. Let us know what’s wrong with this preview of The Leopard Hat by Valerie Steiker. In this tender loving memoir, Valerie Steiker evokes a magical childhood on the Upper East side of New York with a woman whose own losses led her to delight in family, beauty and life itself. Valerie Steiker’s Belgian Jewish mother, Gisèle—who, as a child in Antwerp, was hidden from the Nazis—wasn’t a typical American mom. She spoke with throaty Belgian Rs and wore only hi In this tender loving memoir, Valerie Steiker evokes a magical childhood on the Upper East side of New York with a woman whose own losses led her to delight in family, beauty and life itself. To ask other readers questions about The Leopard Hat, please sign up. This is a marvelous memoir... rich in wonderful detail of a happy child's family and life in 60's New York. Her opening descriptions of her mother's beauty parlor was right out of my childhood... not so much the 'going to', as my mother did not, but of the knowing about and imagining the lives of those who DID patronize such places.... and the images of her family's apartment on Madison Avene, of her mother's wonderful foibles and eccentricities, of her eclectic tastes and her standards of behav This is a marvelous memoir... rich in wonderful detail of a happy child's family and life in 60's New York. Her opening descriptions of her mother's beauty parlor was right out of my childhood... not so much the 'going to', as my mother did not, but of the knowing about and imagining the lives of those who DID patronize such places.... and the images of her family's apartment on Madison Avene, of her mother's wonderful foibles and eccentricities, of her eclectic tastes and her standards of behaviour and decorum..... all a bygone day, which I very much grew up on the periphery of..... really wonderful. I am loving the energetic and enthusiastic characters described, the joys and fun-in-growing up that Valerie and her sister Stephanie experienced with an extremely loving and positive mother and father.... a truly marvelous and rich book, especially for any and all of us who may have once lived in that world or on its edges. on page 166: This book is extra ordinary.... not 'extraordinary!' with all the word's fanfare overuse, but rather it is 'extra' 'ordinary', a superb narration of love and loss and joy. Natalie's descriptive prose is vibrant and alive. The story she weaves about her mother's life rich and nearly sensuous. It is a joy to read, each page a gem. I look forward to every page to come. The Leopard Hat is Valerie Steiker's memories of her mother, Gisèle who died unexpectedly of breast cancer when the author was in college. The loss of a loved one, especially one as close as a dearly loved parent is difficult and sad. Writing this memoir was part of the healing process for Steiker but I wish I had spent my time re I picked up The Leopard Hat right after Harriet was born at a local BookCrossing meeting. I'd recently enjoyed some other memoirs and I liked the leopard spotted cover. Steiker grew up in the sort of families that the New York Times is always covering — the ones who stress over au pairs, private preschools and all sorts of other luxuries that leave the rest of us scratching our heads over. So when Steiker, as an adult is looking back on her childhood and bemoaning how hard it is to do things for herself now that her mother is gone, I find myself thinking of Lenina Crowne from Brave New World who has been so programmed by society to be infantile in her needs and desires. This charming memoir takes the reader through the world of the Steiker family. Their world is a happy one, filled with love, style, books and simply, all good things in life. The author takes us through the life and adventures of her mother, Gisèle Neiman, an extraordinary woman who raised her daughters with such élan and grace. 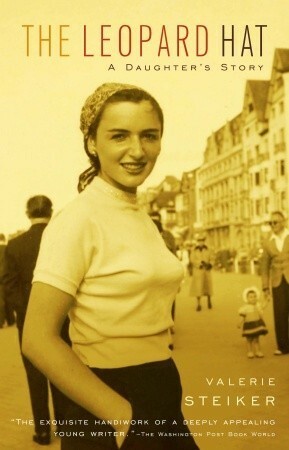 With the death of Gisèle, there is sadness, but the memory of her life brings a certain beauty and a understanding. In short, I simply loved this book. good, good. this is another book that easily conjures (do i put 'up' after 'conjure'?) images from films, other books, other cities, places, new york, of course, among them. however, there were a little too many things in there - in those images, in the story. things that i found hard to relate to. due to the soviet past, i think. I remember Anna Quindlen recommending this (along with Beekeeper's Apprentice) on the Today show a few years ago and it has taken me all this time to read it. A lovely counterpoint to all the hard knock life memoirs currently filling up the shelves. The book shines when the author is describing her mother, less so when she talks about herself, but still a worthwhile read. I think that the author needed a better editor (again). There were really good parts of this, but the lack of unity, lack of any sort of organizing principle didn't work for me. It was as if she wrote a series of essays, rather than a non-fiction memoir. I actually wanted to know her mother better, rather than hear so much about the author. I loved this book as a reflection on how we become who were are through our mothers. One of my favorite quotes, "To create something meaningful as an adult is all the more precious because you know how ephemeral life is, how painful and difficult and even ugly it can be." It is really good. I appreciate the concept of writing a glowing memoir about your idealized mother -- but it should probably be kept just for family. Writing style aside (simplistic) I thought this book was overly sentimental and only parts of it were truly interesting. I want to write stories for my daughters. I'm glad my mom, my Granny, and my Aunt Fredukah told me so many stories about their lives that I can pass forward and share: this book is the inspiration to keep telling those stories. I think I've now read it three times. A well-written and enjoyable account of a woman and her relationship with her mother. There are ups and there are downs, and the author doesn't sugar-coat the past. There is a sentiment tone, but it never overshadows the quality of the work. I loved this book, too. Valerie Steiker is one of those amazing writers who happens to be a brilliant editor, too. Would I recommend it? Not sure.